Online shopping is great for many reasons; it’s convenient, you get to avoid the traffic jam and have packages delivered straight to your doorsteps. But for some sites, it gets even better better – you can actually earn extra cash while shopping. In this week’s review, I’ll show you how to make money on eBates AND possibly transforming you from a shopper to a blogger. Sounds exciting? Let’s get started. Ebates (which sounds a lot like rebates) is a cashback shopping portal that was established in 1998. Partnering with more than 2000 online retailers, it offers a variety of categories for people to shop through their site. To date, the company has paid members more than $325 million in cash back. The revenue model is based on the concept of affiliate marketing whereby Ebates earn sales commissions from the advertisers when a purchase is made. This commission is then split between the company and you (the shopper). For example, say the commission for a $100 product is 10%. When someone buys this item, Ebates gets $10 from the merchant and the buyer gets half of that which is $5, in the form of a 5% cash back. The accrued payment is every 3 months with a minimum of $5 or more and you can opt to receive a post check or via PayPal. If you are feeling generous, you can also divert the cash back to a charity, organization or a needy family member of your choice. 1) In order to earn the cash back, you need to open a user account on Ebates. 3) Take note of the weekly newsletter for store promotion/coupons so that you can plan your purchase ahead. 4) When buying something, make sure that you click through the cashback link on Ebates which will then bring you to the retailer site. Stay in the same screen until the payment process is complete so that Ebates can track your activity accurately. 5) To earn more cash, look out for the Double Cash Back/Hot Deals promotions that usually last for certain period. 6) There is also the Luxury Deals that feature high end branded items if you are into those. Generally, this model can help to save a lot of money if you are always buying from a particular merchant that’s featured on Ebates. But there’s another method to earn more than just cash back that can potentially lead to an additional income stream for your household. How Does It Work For Bloggers? With Ebates blogger program, you get to earn $5 for every new member that make purchases totaling $25 (or more) within the one year of signing up. 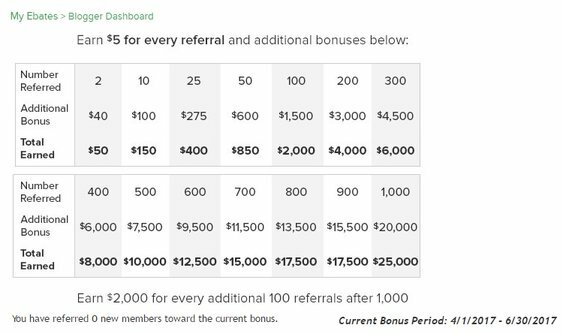 This is called a qualified referral and the bonus value might differ according to different time period. You also get to earn from the subsequent tier bonuses as shown below. 1) The first easy method to acquire referral is through your email contact where you simply invite friends and families from your Gmail account using the predesigned text. 2) The second method, which is a better long term approach, is to create a niche website and use your personal link to drive referral to Ebates. 3) A niche is basically a group of people searching for the same thing online and your primary role here is to write useful information (through blogging essentially) to help them decide on their purchase. Somewhere in the content is where you recommend the use of Ebates and since there are thousands of merchants to target, there’s no limit to the type of niches that you can be part of. 4) The first thing you need for a blog is a custom domain name – meaning, a website name that reflects what the blog is all about and is something that you pay for (and thus own). 5) The next thing to consider is to use a content management system platform instead of website builders to launch your site. The main reason is because the latter come with many feature limitations that can hinder the progress of your blog in the future. Hence, WordPress is always my platform of choice and here’s a guide on how to create one for free. 6) When it comes to blog content, I highly encourage that you learn the foundation of keyword research and write useful topics with the intention of helping your readers; not just to get referrals. In doing that, two things will happen – people don’t feel pressured reading your articles, they stay longer on your site and the search engines reward your content with higher rankings. 7) Having said that, you also want to be using the Ebates button/link appropriately. Don’t hard sell to your audience and certainly avoid making your site look spammy with all the advertisement. 8) Marketing tips – leverage from special occasions such as Mother’s Day, Valentine’s Day or Christmas holidays because that’s when merchant offers are the most attractive giving the consumers a good reason to shop online. Which One Are You – The Shopper or The Blogger? One helps to save money and another one adds to your income stream. So no matter which one you choose, it’s a win-win situation for everyone. I sure hope that this review has taught you how to make money on Ebates and as you can see, doing online shopping on this site can be both budget-saving and income-generating, an opportunity you don’t get to see very often with other type of platforms. If you like to learn how to start an online business with Ebates, please visit Wealthy Affiliate for more training classes and helpful resources. Have any thoughts or questions about this topic? Feel free to leave your comment below and I’ll get back to you. Should You Use Cratejoy to Start a Subscription Service Business Online? Is Storenvy a Good Place to Sell Products Online? Hi, Cathy. I had heard of Ebates but never really understood what it was all about. I shop a lot through Amazon, Khols, and of course Walmart. It seems I am missing out on some cash! I also did not know about their affiliate program for bloggers. This seems like a great way to make some extra money. I am really glad I found this and am very interested in using Ebates. Thanks for all the information. Never too late to try Jean. Go for it! This is the first time I have heard of Ebates. It sounds like one could benefit both ways – by being a blogger and a shopper. Would it be possible for one person to make money both ways? I am always on the lookout for new ways to make money online and helping others do the same thing. Yes Linda, you can monetize both ways. Start by finding a niche that interest you in the retail world that also link to Ebates and blog about it. Try out the site as a shopper (you can get a ton of information from their newsletters) first to get some customer related experience and then translate that into your blog to show your audience how they can also benefit from a service like this. Well Cathy I learn something new every day. First I had heard of Ebates, but really didn’t think that it was worth the trouble. But, I buy a lot on Amazon and did not realize I could get cash back for that. I also did not know that this would work for bloggers, which will be very beneficial to me. So when I sign up, do I have to have an account for purchases and a separate account for my blog? Just curious. Hi, you just need to have one account for both purposes. When you enter the site as a shopper, scroll all the way down to the footer and look for ‘Affiliates’. Click on it and you should be able to find the unique code which is your affiliate link to be used on your blog. Hi, Cathy. This is an interesting read. I have not heard of Ebates before this. I will definitely be doing some research on it now. Thank you for sharing this information. I have just turned from shopper to blogger a little over a couple of months now. LOL. Are you using Ebates as well? I am just wondering what the cons are if any. Hi Cindy, I don’t use Ebates because I live outside of US. However, from what I know, some bloggers have issues with their payouts, as in not receiving them on time. The other one is that, their product categories are not as diversified as say, the Amazon marketplace. Hence, not all type of niche blogs will benefit from the referral program. Thank you for your effort with Ebates. I’m always looking for more income stream opportunities and I have to say that this one is really surprising. Getting paid for doing shopping from the comfort and security of my home is really an excellent idea, Now why didn’t I think of that before. 50% cash back on Ebates commission is not bad at all. As a shopper to also be able to get double cash back on certain deals as an added bonus is amazing and my purchases are delivered as well. What’s up with that? Connecting a credit card to my Ebates account – that is genius I think, so I can also get cash back for in-store purchases. The blogger program looks like a no brainier to me for an extra source of income or even a primary source if you asked me. Just to confirm, would you recommend a person to do both shopper and blogger for a win-win situation? I think that is the way to go – do both. Thanks again for the wonderful opportunity presented, and in such a clear and concise manner. Hi there Rudolph, I think if you can use Ebates for shopping, it will give you a first hand experience in product purchase and shipping services. That way, you can share with people what’s the best deals to look out for, whether it’s through blogging or verbally.